The Prescott Side Table is an ideal end table for any room in the house, or any area outside! This side table is a perfect addition next to any seating you may already own, giving you a handy place to set drinks, books, or any other number of items. A second shelf below the table top serves as a great storage area. Its sleek, clean design will coordinate well with a wide variety of styles of furniture or decor you may already own. Built out of high quality aluminum finished with a durable powder-coating this side table is both lightweight and rust-free. 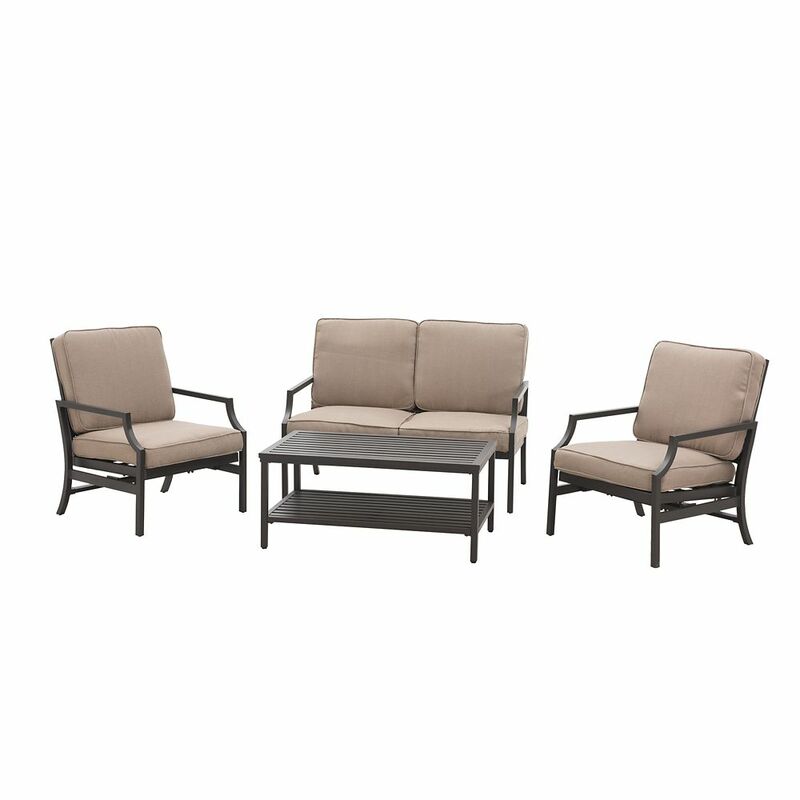 Pine Ridge 4-Piece Deep Seating Patio Set The Prescott Side Table is an ideal end table for any room in the house, or any area outside! This side table is a perfect addition next to any seating you may already own, giving you a handy place to set drinks, books, or any other number of items. A second shelf below the table top serves as a great storage area. Its sleek, clean design will coordinate well with a wide variety of styles of furniture or decor you may already own. Built out of high quality aluminum finished with a durable powder-coating this side table is both lightweight and rust-free. Pine Ridge 4-Piece Deep Seating Patio Set is rated 1.0 out of 5 by 1. Rated 1 out of 5 by John from This is one cheap piece of furniture. I have to... This is one cheap piece of furniture. I have to get a piece sent to me because they welded it backwards. It was suppose to be tan cushions but there more green than tan. I would send it back , but I cut up all the boxes. Don't waste your money on this. It was way over priced for the quality I got.